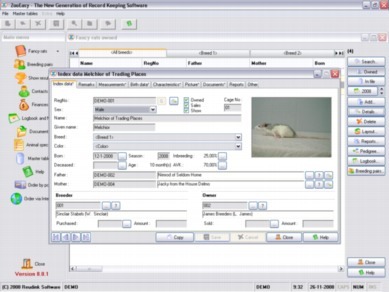 ZooEasy Rat Software - the ultimate program for breeding and raising rats! This computer program is ideal for creating a professional digital administration of all your rat data. ZooEasy Rat Breeding Software allows you to easily select optimal breeding pairs, make rat pedigrees, and record the characteristics, medical history and genetic information of your rats. Moreover, finances, show results and contacts can be recorded to provide a complete overall database for rat breeders and all those raising and rearing rats. ZooEasy Stand Alone is installed on your own pc. Would you prefer to work online? Click here. Also suitable for members of rat clubs and associations such as the National Fancy Rat Society, RMCA, AusRFS , AFRMA, RSA and ANRA. This software can be used by those breeding and raising rats of all breeds. 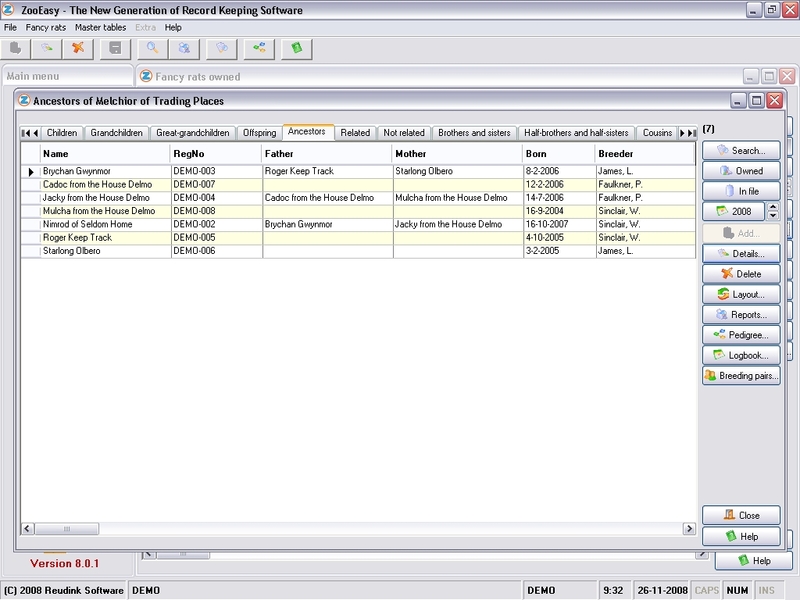 Obtain a clear and professional overview of your rat pack with ZooEasy Rat Breeding Software. All index data and genetic information of your rats such as names, appearance, color, coat condition, eyes, birth data and behavior can be registered. Moreover, measurements such as weight, size developments and growth can be recorded as well as the blood relationships of each rat. A complete medical history of your rats is created by recording medical results such as vaccinations and test results. We understand the importance of healthy and responsible rat breeding. Therefore, ZooEasy rat software allows you to calculate relationship percentages and inbreeding coefficients when selecting breeding pairs. This means inbreeding can be prevented and genetically healthy offspring is ensured. 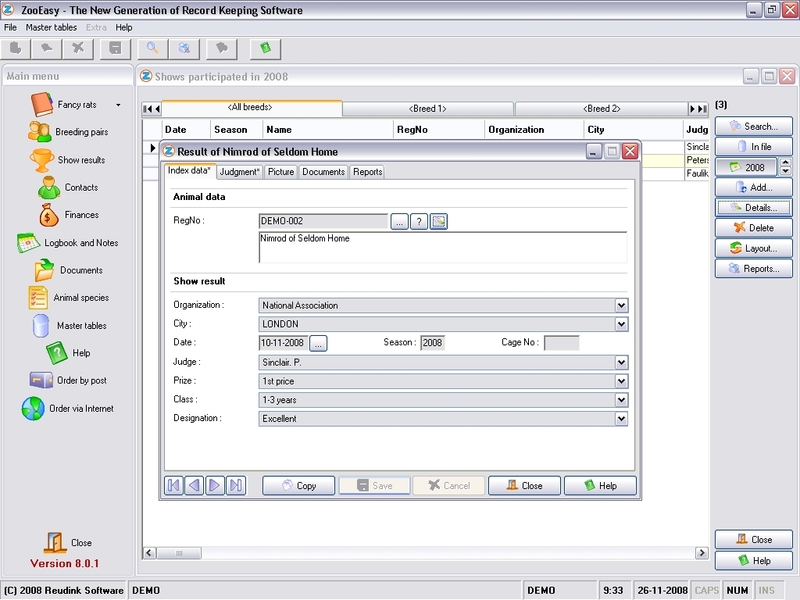 ZooEasy rat software also enables you to cross-breed by adding rats from other rat breeders. With ZooEasy Rat Software, the finest pedigrees can be created. Rat pedigrees can include a picture and your own watermark or logo. Also the bloodlines of each rat can be traced without limitation. Centralize all contact details of your contacts including customers, other rat breeders, suppliers, rat clubs and associations. 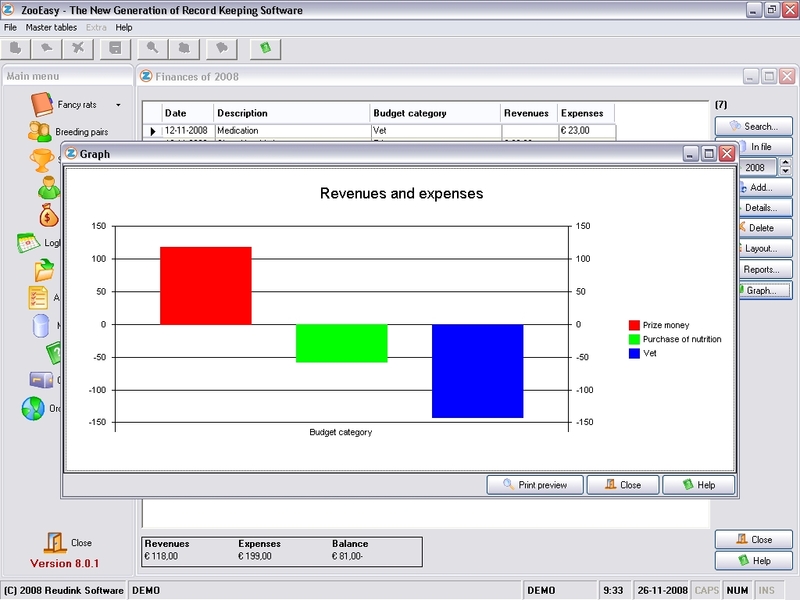 You can also manage the finances associated with your rat breeding and rearing by recording expenses and revenues. In addition, maintain a record of rat shows and competitions as well as the awards achieved by your rats. 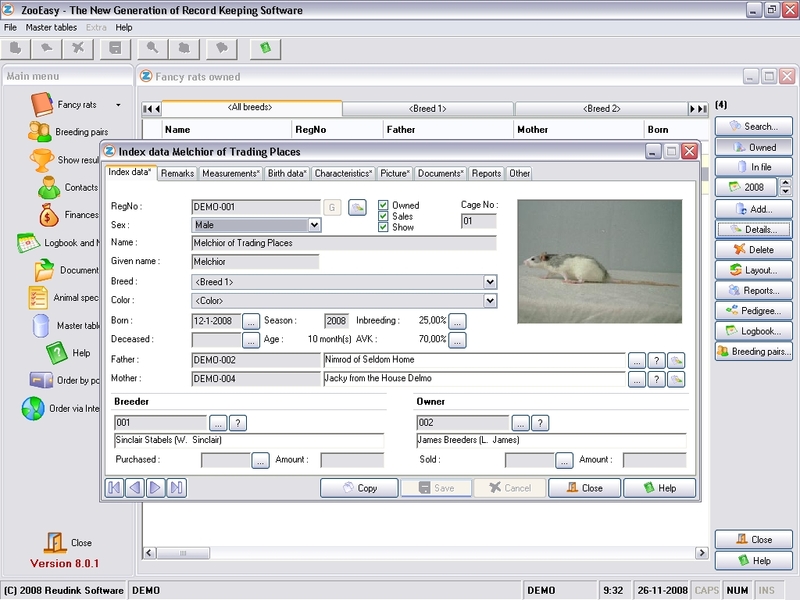 Multiple digital rat pictures and documents can be added using ZooEasy rat software. Also detailed reports of the recorded rat data are easily generated. Moreover, the ZooEasy program has clever and easy-to-use search options to sort through all your rat data. 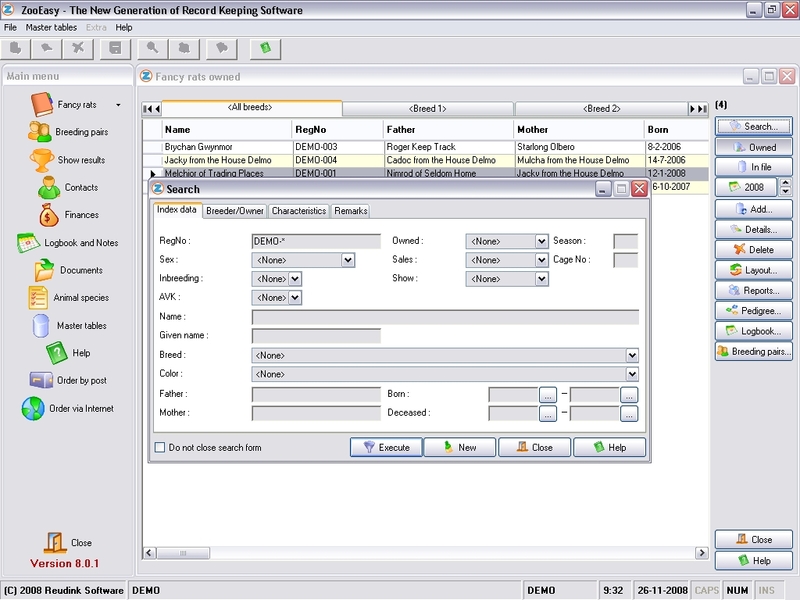 ZooEasy rat software is easy to use and allows you to develop a complete digital administration of your entire rat pack. All data related to your rats, including rat pedigrees, is registered together in one orderly database. This user-friendly program will form an indispensable aid for all those breeding, raising and rearing rats. ZooEasy is known for excellent product support and outstanding service. 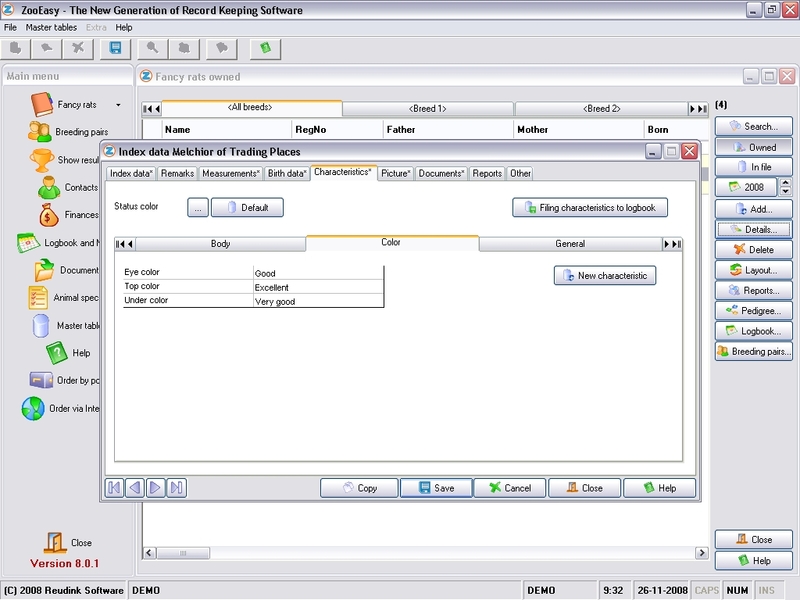 With a professional helpdesk and easy-to-use manual, rat breeding software could not be made easier. ZooEasy is well-established in the rat breeding industry and currently serves over 12,000 customers worldwide. 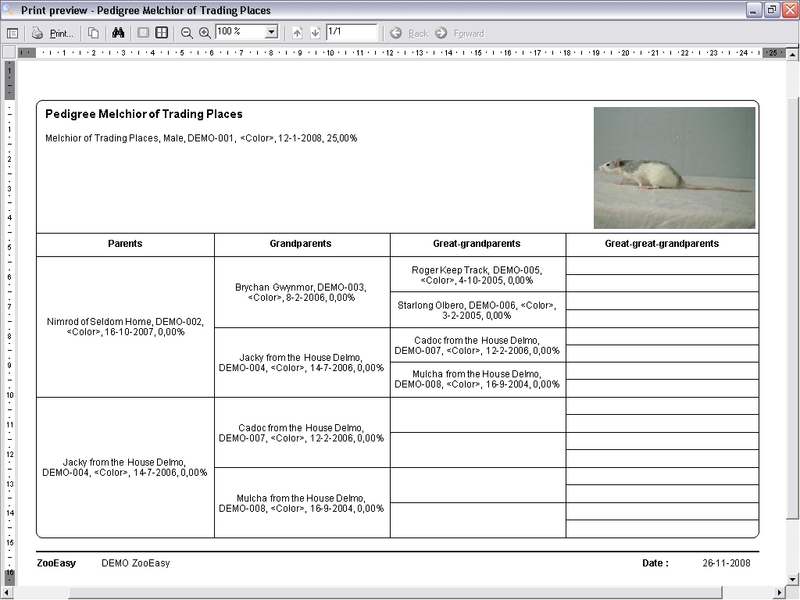 Our rat software is used by many individual rat breeders and owners but also by clubs, associations and petting zoos. ZooEasy software for rats is available on CD-Rom and as a download version. Both can be ordered online in 5 simple steps by clicking here. If you have any further questions please do not hesitate to contact the ZooEasy helpdesk or call us at +31 (0)85 303 29 90. .